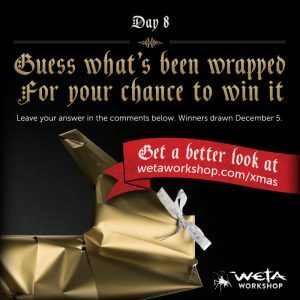 If you’ve been following our friends at Weta Workshop on social media, then you’re already aware of their current 12 days of Christmas promotion. If you haven’t been following them, make sure you start or you’ll be missing amazing events like this one. Weta is now into Day 8 of their 12 Days of Christmas. Each day brings a new riddle fans can guess the answer to for a chance to win great prizes. How do you get the chance to guess and win? You can guess on today’s item, or on any of the previous items, via Weta’s various social Media platforms. You have until midnight, New Zealand Time, on December 5th, 2016. So get those guesses in and good luck!